BREMEN, Germany – Theater am Goetheplatz, also known as Bremen Theatre, recently installed a TiRAY line array speaker system. The Neoclassical style Theater am Goetheplatz is the main theatre in the North German city of Bremen. Commonly known as The Bremen Theatre and dating back to 1913, this listed building today presents a varied programme of musicals, opera, drama, readings and more. With seating for around 800, the theatre is an important cultural hub and is well known throughout the country for its role in premiering new works during its very busy schedule. Introductions to plays, audience discussions after performances and a series of talks that directly engage with the public are also features of this busy and progressive venue. This varied programme of events demands exceptional audio quality for every performance and having this year taken account of its existing provision, the theatre’s management decided that the audio system in place was no longer fit for purpose. 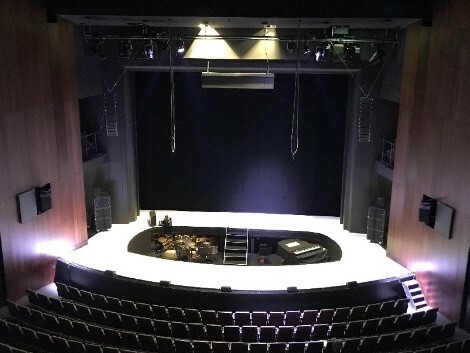 The Bremen Theatre consulted with CODA Audio Deutschland and having taken account of the company’s recommendations, elected to install a system based around CODA Audio TiRAY line-array speakers. The installation comprised 24 x TiRAY (12 per side) complemented by 6 x SCV-F subwoofers and 5 x HOPS5 as frontfill. The system is driven by 4 LINUS M-RACK (LINUS14D amplifier in 3U case). Hooked up to two Digico consoles for advanced zoning and signal distribution, the audio is transported to the LINUS14D via DANTE. TiRAY is a remarkably compact, super light system that delivers a far greater punch than many of its more sizeable equivalents. The HOPS5 has a similarly impressive output to size ratio, with high fidelity sonics and plenty of kick. In a medium size setting such as the Bremen Theatre, TiRAY is visually discreet, yet comfortably powerful enough to cope with the demands of any production. With a CODA Audio TiRAY system in place, The Bremen Theatre now has an audio system to match the premium quality of its rich and diverse programme of events.